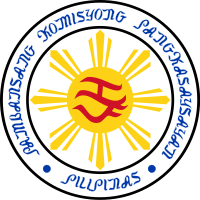 The National Historical Commission of the Philippines (Filipino: Pambansang Komisyong Pangkasaysayan ng Pilipinas, abbreviated NHCP) is a government agency of the Philippines. Its mission is "the promotion of Philippine history and cultural heritage through research, dissemination, conservation, sites management and heraldry works." As such, it "aims to inculcate awareness and appreciation of the noble deeds and ideals of our heroes and other illustrious Filipinos, to instill pride in the Filipino people and to rekindle the Filipino spirit through the lessons of history." The present day NHCP was established in 1972 as part of the reorganization of government after President Ferdinand Marcos' declaration of martial law, but the roots of the institute can be traced back to 1933, when the American colonial Insular Government first established the Philippine Historical Research and Markers Committee (PHRMC). The Philippine Historical Research and Markers Committee was created by U.S. Governor General Frank Murphy, by Executive Order 451, to identify and mark "historic antiquities" in Manila as a first step towards their preservation. Church of San Agustin, Fort Santiago, Plaza McKinley, Roman Catholic Cathedral of Manila, San Sebastian Church, Concordia College, Manila Railroad Company, Dr. Lorenzo Negrao, and University of Santo Tomas (Intramuros site) were among the first structures to be granted markers. The installation of markers were first limited to identify antiquities in Manila; however, the commission's mandate was later expanded to cover the whole of the Philippines. Many markers were destroyed or lost due to World War II, along with the structures they represent, and many have been replaced by post-war markers. This first committee was composed of American journalist Walter Robb who served as chair; American Anthropologist H. Otley Beyer who would later be known as the father of Philippine Anthropology; Spanish Jesuit Fr. Miguel Selga, SJ; dean Edward Hyde from the University of the Philippines College of Engineering; and Filipinos Jaime C. de Veyra, Conrado Benitez, and Eulogio “Amang” Rodriguez. With the establishment of the Philippine Commonwealth in 1935, the PHRMC was replaced by the Philippines Historical Committee (PHC), which took over the functions as its predecessor, as well as the tasks of repairing government-owned antiquities and acquiring antiquities owned by private individuals. There are no known records of the activities of the committee during the Japanese occupation of the Philippines during World War II. In the postwar reconstruction years the PHC was busy as there was a government interest in "the reconstruction of the past as a means to form nationhood." Reconstituted six months after Philippine independence in 1946, the committee was first placed under the Office of the President, and then transferred to the Department of Education. During this time, it installed over 400 historical markers all over the archipelago; named and renamed various streets, plazas, towns and other public places; and acquired places and relics of heroes. As the nation rebuilt itself, a number of other historical commissions were also created by law to commemorate the birth centennials of various Philippine heroes of the late 19th century. All of these commissions were eventually merged into one National Heroes Commission created in 1963. In 1965, Congress passed Republic Act No. 4368 that created the National Historical Commission and effectively abolished the Philippine Historical Committee and the National Heroes Commission whose functions were delegated to the NHC. Among the functions of the NHC are the following: to publish or cause to have written or published the works of our national heroes and other great and good Filipinos; to compile from various sources here and abroad data on Philippine history and prepare and publish there from source books on Philippine history; to identify, designate and approximately mark historic places in the Philippines and to cause the construction or reconstruction and to maintain and care for national monuments, shrines and historic markers that have been erected; to take charge of all historical activities or projects not otherwise undertaken by any entity of the government; to gather data on historical dates, personages, events, and documents presented for evaluation, and to acquire through purchase, donation, exchange or otherwise, important historical documents and materials; and to encourage researches in Philippine history and the writing and publication of textbooks on the subject, the research and writing of biographies of heroes, accounts of historical events, translations of important scholarly works of Filipinos and foreigners by providing appropriate or adequate incentives. In 1972, President Ferdinand Marcos' declaration of martial law resulted in a reorganization of government and the renaming of the NHC as the National Historical Institute. On May 12, 2010, President Gloria Macapagal-Arroyo signed the law reverting the National Historical Institute into its original form as the National Historical Commission of the Philippines. The NHCP still undertakes all the functions of the previous commissions, most notably those of preserving historical sites and structures and serving as lead agency for the commemorations of Independence Day, Rizal Day. Evaluates heraldic items and devices as to conformity to government standards. Organization and strengthening of various historical committees and associations (i.e. provincial, city, municipal, institutional, etc.) private or public, as active partners in the dissemination of significant historical events and personalities at the grass roots level. Performs such other functions consistent with NHI’s institutional mandate and existing laws. To enrich and update knowledge on restoration and preservation techniques through scientific research and establishing linkages between the Philippines and various international bodies engaged in the scientific preservation of historical and cultural objects. Provides management with the necessary financial information in order to help the other operating divisions in planning, directing and coordinating their programs, projects and activities. ^ "Mission". National Historical Commission of the Philippines. Retrieved 17 September 2016. Wikimedia Commons has media related to National Historical Commission of the Philippines.